Fancy floppy bow tie, pre-tied for convenience. Adjustable, for necks 14 to 20 inches. Polyester microfiber with fancy satin finish. Hand stitched in USA. Honestly, I am disappointed with the tie and did not wear it to the event I wanted to go to. The 'hook' that is mounted just behind the tie is not really behind the tie, and to wear it with a stand-up collar is impossible because the clasp shows! I have it packaged ready to return. Also, somewhere along the line a mistake was made, I really wanted the 001220 Deluxe Western Bow and I got the 001223 Deluxe Floppy Bow. I cannot declare who was at fault, but I was going to wear it anyway. Well constructed, quality materials. Looks as good 'in person' as in the photo. The tie was well made and adjustable and looks great with both my outfit and my husband's. Wonderful! Beautiful bow tie, I totally love it. Needed this to complete a costume for a play - arrived pre-tied (thank you!) and easily adjustable. Seriously considering switching entire wardrobe to 1880's look. Thank you! Nice job whoever tied it! The tie is just dandy. As shown, as expected! Not cheap quality. I had as many comments on the tie as I did the coat. People loved it. I look like I just arrived by train from Fall River. Lizzie would have loved it. I wanted to try something else after all those standard bow ties. This is a great alternative. Easy to put on, easy to adjust, looks perfect and you can wear it to both a less formal Gentleman's attire or alongside a dashy Western outfit. Have had a lot of positive feedback from various people. The details matter and this is just the right touch to go with the Victorian blouse. Well made. Very nice size and received many compliments and inquiries. 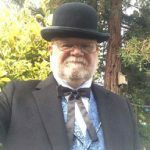 Though more western in style I recently wore it to a Dicken's event. Well made. Historical Emporium has been my one stop for Victorian or Western wear for a few years. Satisfied customer. Something different for parties, opera and symphony! It is a great-looking tie. Correct Cravat for the character. Advertised to fit up to 20 inch neck. It was tight on my 17 inch nick. The tie is good, but $8 shipping for something that should only cost maybe $3? And that's on top of an item price tag which is already far from charitable. But, I do like the tie. Usually here is an elastic component to bow ties but your ties was lacked this necessary component! your mailing costs are excessive. Excellent. Had a proble, whichnwas my fault. It was handled with courtesy and professionalism. Easy to order, fast shipping and great costumer service.